Jay McLean is the author of the More Than Series, the Road series, and the Combative trilogy. Jay is an avid reader, writer, and most of all, procrastinator. When she's not doing any of these things, she can be found running after her two little boys or devouring a tacky reality TV show. Visit her at jaymcleanauthor.com. The talent that Jay Mclean shares with her readers is just... inspiring. I want to experience friendship like the More Than gang. Love, like them, and I kind of wish I was Lucy. But above all, this whole series has gripped my heart from the beginning, I have shed more tears and laughed until I cried more times than I can count with these books. I have so much thanks for being able to experience these stories. 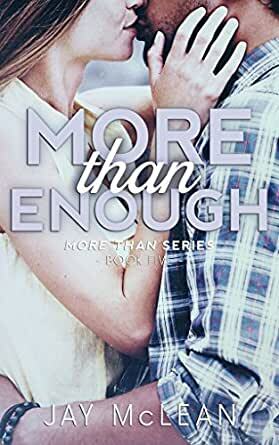 More Than Enough was the perfect, bittersweet finale to all 5 of these amazing journeys. I have no doubt I will be rereading this series several times. I also have no doubt that this will remain my fave series. I am in awe of your talent Jay Mclean. Thank you, so much, for sharing it with us. This was an amazing book for me it was the best of the series. I really liked showing that a relationship can just fade, especially one from our youth, and that friendships can be maintained beyond said relationship. Jay is awesome. I so didn't see that as Dylan's story but damn to I love him and Riley together. I almost hated Heidi but glad she redeemed herself to me. Can't wait to put the paperback on my bookshelf with the others. What an amazing book ! I loved the characters, their story and just everything about this book ! Was sad to see the series end though. Jay McLean you are an amazing author ! What an awesome end to an awesome series, loved this book just as much as the rest of the series! Perfect. In love. Amazing. Heartbreaking, and Heart mending. Jay McLean is an astounding writer. Thank-you for bring an end to the More Series with this book about Dylan and Riley. Laughed, cried and smile all while reading this book.